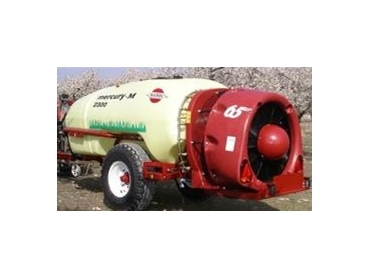 The design of the Hardi Mercury mist blowers will meet most demands. They are robust, easy to use machines with arrange of impressive features. Potential consumers can choose from a large variety of Hardi’s axial fans and deflectors. The axial fan series Symmetric Flow (SF) of blowers are especially developed to provide high and uniform air volume, This allows penetration of tall dense trees, such as citrus and cherries, at high forward speeds. Match: Deflector device fitted in SF65 or SF85 blowers. These blowers are made for the best possible penetration in very dense crops, such as citrus, avocado, walnut trees and hops. Air kits: SF65 and SF85 axial fans provide up to 65.000 m3/h and 85.000 m3/h respectively. Deflectors: Duo deflectors and Jet deflectors in combination with SF65 is the right setup in hedge row orchards. The deflectors provides a drift reduction and higher sedimentation in the crop. Hardi diaphragm pump: Economic maintenance. Easy to operate. Self priming without risk of damage if it runs dry. Control units: Manual and electric operating units are available. The electric EVC control is prepared for Hardi Controller 2500 and 5500 which allow the user to control and monitor the mist blowers’ application.